Death of Fr. Bismarque; Why are Church Authorities Silent? Death of Fr. Bismarque has rattled all the Goans. There is a big debate on what could have caused his death. Was it an accident as the authorities are suggesting? Or it was a cold Blooded murder, as his followers are suspecting? Things are getting murkier by the day. He was a social worker, taking up various issues. He was against Church authorities, disposing off Church Properties and vocal about it. He was defrocked by the Archdiocese for this reason, it is given to understand. Silence of the Church in the context of his death, has not gone down well with Catholics. Following Videos should help readers to draw their own conclusion. Meanwhile, We at SILENT VOICE, Pray for his soul and hope that the truth prevails. Comments Off on Death of Fr. Bismarque; Why are Church Authorities Silent? An outspoken colleague within the clergy is holding the Church authorities indirectly responsible for the fate of Fr Bismarque Dias, who was found dead in the creek at his St Estevam village last week. Fr Michael Fernandes, a fighter himself, has also asked why the Church has officially not come out with a single statement on Fr Bismarque’s death in suspicious circumstances. “I am not saying that the Church authorities are involved in killing Fr Bismarque. But he was not protected by the Church when he was fighting the sell-out of Goa”, Fr Fernandes told goanews.com. A practicing lawyer since 1990, Fr Fernandes has also been fighting people’s issues and taking up court cases of the exploited and helpless class of the society in the port town of Vasco. It all started, according to him, when Fr Bismarque found out that the Church had sold out a gifted land at Vaxim Island to a Bangalore-based party to build a resort and a golf course etc. As he recalls, Fr Bismarque was at that time living in a rented room and looking after the construction of a building of Blessed Sacrament Society at Alto St Cruz. As he started mobilising the people against the sell-out of the Church land to the hotelier, the Church of Goa immediately transferred him to the USA in 2010. As a result, says Fr Fernandes, his fighter colleague had preferred to stop preaching and fighting public issues by living in his St Estevam village rather than going to the USA, obeying the Church order. After two years, two opposite opinions emerged within the Church when Fr Bismarque decided to contest Assembly election from Cumbarjua as an independent candidate. 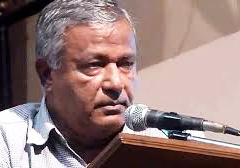 Fr Mousinho Ataide, an expert on Canon Law and professor at Rachol Seminary, had ruled that there is no prohibition on a priest contesting Assembly election and Fr Bismarque need not take permission from the Church. As he recalls, Fr Ataide had also stated that he would require to take permission of the Church only if he gets elected and not to fight election. Fr Eremito Rebello, convenor of Goa for Dabolim Only, had expressed difference of opinion on Fr Ataide’s view, but could not provide a second opinion, quoting the Canon Law. He also disclosed that Fr Bismarque was once again getting himself prepared to fight the forthcoming Assembly election in 2017 from the same constituency, with a larger public support. In fact Fr Fernandes alleges that the priest candidate was defeated by his own senior colleagues within the clergy, who secretly pressurised the priests in Cumbarjua constituency (including Old Goa) to tell the people not to vote for him. While Fr Bismarque was fighting the real estate barons and the government authorities in his village, Pernem taluka and all over Goa, Fr Fernandes feels the Church did not protect the fighting priest. According to him, the priests are today supporting the public meetings and candle light vigils at personal level and the Church has not given any official directive to support the public protests, not even through the Council for Social Justice and Peace. He also alleges that the police are not probing Fr Bismarque’s death case from all the angles when he had been receiving threats to his life. Fr Fernandes has been transferred to Clergy Home of aged priests with only two inmates by creating a new post – Assistant to the Director. He has challenged this transfer as well as the creation of this post since the Clergy Home of two inmates is being looked after by two senior priests. Fr Fernandes presently lives at his own Vasco flat, as a practicing lawyer. “The path of violence and hatred cannot resolve the problems of human and using the name of God to justify this path is blasphemy,” he said. Using God’s name to try to justify violence and murder is “blasphemy,” Pope Francis said following the terrorist attacks on Paris. “Such barbarity leaves us dismayed and we ask ourselves how the human heart can plan and carry out such horrible events,” the pope said Nov. 15 after reciting the Angelus prayer with visitors in St. Peter’s Square. 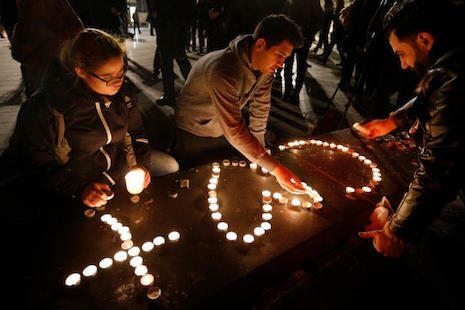 The attacks in Paris Nov. 13 — attacks the French government said were carried out by three teams of Islamic State terrorists — caused the deaths of 129 people and left more than 350 injured, many of them critically. A suicide bomber blew himself up outside a soccer stadium, gunmen attacked customers at cafes and restaurants and a team of terrorists gunned down dozens of people at a concert. “Modi has two faces: one for India and another for outside India,” said Father Sebastian Poomattom, vicar general of Raipur Archdiocese in Chhattisgarh state, which has witnessed a series of attacks on Christians since the Hindu nationalist Bharatiya Janata Party, which backs Modi, came to power. Indian Prime Minister Narendra Modi has condemned the Nov. 13 terror attacks in Paris, but back home in India, he allows Hindu fundamentalists to lash out against religious minorities, activists say. Joining world leaders for the G20 summit in Turkey, Modi suggested a series of steps to address religion-linked terrorism. “Terrorism is a principle global challenge,” Modi said Nov. 15, two days after the devastating Paris attacks claimed by the Islamic State group. “We must isolate those who support and sponsor terrorism, and stand with those who share our values of humanism,” Modi said in his address, according to a text of his speech. However, activists in India say Modi is employing two vastly different messages for two different audiences. In neighboring Madhya Pradesh state, Christian leaders have recorded more than 100 attacks on people and churches since Modi’s party took power there in 2003. More than 20 of these attacks came in the last six months, but local police have not arrested any perpetrators, Christians say. Some extremist Hindu leaders have publicly called for India to be cleared of Muslims and Christians by 2020, while other fundamentalists have urged strict population control measures for minority religions in the Hindu-majority nation. Modi and his administration, critics say, have stayed silent. At least two Muslims were recently killed because of issues linked with the consumption of beef — many Hindus consider cows to be sacred — and at least six churches were attacked in New Delhi alone since Modi came to power in 2014. But Modi’s administration often dismisses such violence as sporadic crimes. Hafiz Ahmed Hawari, head of the group All India Jamait-ul Hawarin, told ucanews.com that religion-based violence is increasing — part of a climate of fear for minority Christians and Muslims in India. John Dayal, a prominent Christian activist, believes Modi’s remarks at the G20 are a screen for his domestic policies. “Prime Minister Modi thinks he is making common cause with perceived anti-Islam feelings in western people, political groups and governments,” said Dayal, who is also a board member with ucanews.com. 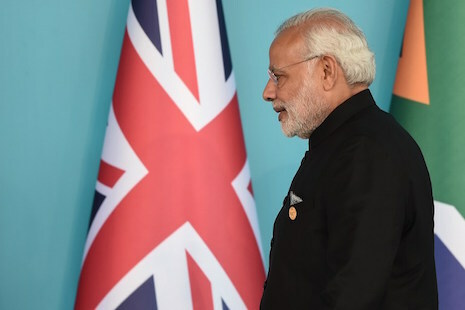 Vijayesh Lal, a member of the Evangelical Fellowship of India, said Modi should translate his words against religious terrorism abroad into action within India itself. “Terror should be equally condemned whether it is in India or abroad,” he said. However, members of the ruling Bharatiya Janata Party said religious minorities should not equate their “minor problems” to the terrorism of the Islamic State group. “It would be erroneous on the part of Christians and Muslims … to equate law and order problems and petty communal tension in India with the scale of terrorism Islamic terrorists have unleashed the world over,” said Jagdambika Pal, a parliamentarian with the party.